Sony has announced launch of a new smart phone to the already crowded mid range Android smart phone market. 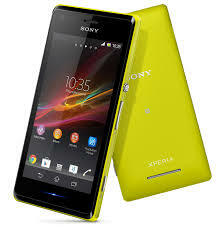 Named, Xperia M, the smart phone is a budget-oriented phone will be available in single as well as dual SIM models. From the looks of it, the Xperia M looks and feels very similar to the Sony's Xperia L. It is also similarly spec'd as Xperia L but Sony has showcased this phone specifically for the budget buyers who want a Jelly Bean equipped Sony smart phone. Xperia M will have a 4 incher (FWVGA 854 x480) display which will be protected by a scratch resist glass panel. The usual Sony hallmarked multi coloured LED illuminations will also adorn this one. It will also be the first budget phone to have the Sony’s OmniBalance design, which the company claims helps in daily handling of the device. Powered by dual core 1 GHz Snapdragon SoC processor, Xperia M will have 1GB of RAM running it. The internal memory has been limited to just 4GB but the phone supports microSD expansion upto 32GB. Xperia M will also feature the 5MP Exmor RS sensor fitted camera on the rear with a LED flash. There will also be a front facing camera but Sony has not mentioned the specs for it. The Xperia M will run on Android 4.1 Jelly Bean. It will have NFC, bluetooth 4.0 and HSPA + support but LTE is missing from the specs. The phone is expected to be priced in below Rs.15000.00 and will be available in multiple colours including Purple and Yellow. So are you prepared to wait till September 2013 for this Yellow Yellow Dirty Fellow. though its good sept is too late. my bb plan expires in july star n i need to replace it with a sub 20k phone any suggestions?